In 1995 I covered the Malaysian General Elections for Nihon Denpa News (NDN), a Japanese TV news agency. The highlight of our coverage was an interview with Nik Abdul Aziz at his mosque on the outskirts of Kota Bharu, Kelantan. His political secretary had told us the best chance to catch him was after his Maghrib prayers. The sky was turning dark, casting long shadows of the palm trees and minaret. Village children were learning the Quran, seated on the shiny floor of the spacious mosque. At the far end, seated on the floor and chatting with some village elders was the Tok Guru – attired in his familiar sarong and headdress. He smiled and beckoned us to sit beside him. We didn’t have any prior appointment. With his secretary’s directions we took the chance to drive to his wooden kampung house and the mosque he had built in the front yard. the air of simplicity and the kampung atmosphere he exuded quickly put us at ease. We were glad we had come, as the proverbial expression says, to hear it from the horse’s mouth. The night before we had attend the rally at the Kota Bharu Stadium where every inch of ground from the terrace to the stadium field was covered with people. The place was a sea of Islamic green, sarbans and headscarves. Shouts of “Allahu Akbar” (God Is Great) punctuated the air intermittently. Split right in the middle of the field, the women in their dark headscarves were on one side and the men were on the other. It was an intimidating sight. Looking around I realised that cameraman and producer Akiyama and I must be the only newsmen around. Incensed by the bias and one-sided coverage, the local press was barred. As for the foreign press, there were none around except us. The issues then as now were the fear of Islamic fundamentalism and the Hudud laws associated with PAS. And so we fired our first salvo. 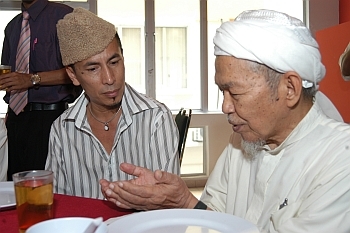 Like the kampung Tok Guru he always was, the benign religious teacher gave us his time and patience. “In order to implement Islamic Laws and cut off a thief’s hand, there must be no injustice or exploitation, no hunger so that there is no reason to steal. Even then, three witnesses must be produced. “I’ve banned all karaoke bars, video parlours and billiard halls because I believe they are bad for our youth and breeding ground for delinquencies. I have built youth clubs, sports facilities, libraries for the young people instead. Please ask the parents, are they happy with me? “Kelantan has the lowest crime rate in the country. 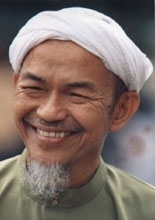 When PAS came into power in 1990, it reduced the license fees of hawkers and trishaw riders from RM20 a month to RM2 a year. “We are pro business and we help the small traders and poor first. We cannot stand corruption. You never get to read this in the local press,” said the Chief Minister. Fast forward to 1999, not only the opposition was completely shut off from the muffled pro government press, what was reported about them was twisted out of proportion. 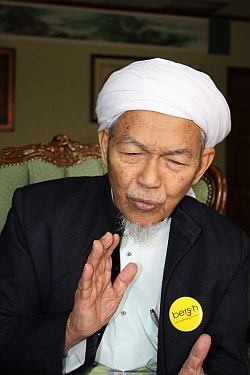 Earlier this year, the Tok Guru was misquoted in the local press as saying he did not want women to work and implying PAS was anti-women. Those who heard the full speech would realise that the reports were twisted out of context and untrue. In fact his speech was very sympathetic to women who had to bear the extra burden of taking care of the children, the husband and having to work at the same time. As Tok Guru Nik Aziz said, we never get to read this in the local press!